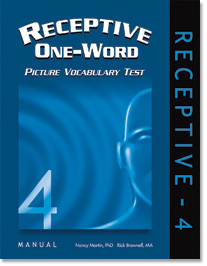 The Receptive One-Word Picture Vocabulary Test, 4th Edition (ROWPVT-4) now features norms through geriatric ages (80+). The ROWPVT-4 is an individually administered, norm-referenced assessment of how well persons age 2 years 0 months to over 80 years can match a word that is heard (in English) to objects, actions, or concepts presented in full-color pictures (in a multiple-choice format). 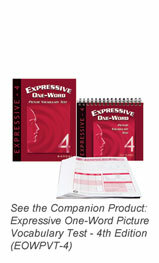 The ROWPVT-4 features additional items for younger children as well as for older adults. The test consists of 190 items presented in a developmental sequence (based on the 2010 normative sample) that reflects the concepts with which people currently have experience through home, school, or media. The expanded norms allow use of the test with adults in various diagnostic, rehabilitation, or therapeutic settings. 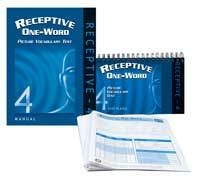 The ROWPVT-4 has been co-normed with the EOWPVT-4 to provide a comprehensive assessment of expressive and receptive vocabulary. What's still true about the test? The examinee indicates (by pointing or saying) the correct color picture (out of four presented) that matches the word spoken by the examiner. Age-related starting points and ceilings (reached when the examinee makes a set number of consecutive errors) ensure that only a subset of items (the critical range) is administered. The ROWPVT-4 is untimed and can be administered in about 20 minutes. Scoring is easy and straightforward, generally taking less than 5 minutes. Raw scores are reported as standard scores, percentile ranks, and (if necessary) age equivalents. SPECIAL OFFER: Save $50 when purchasing EOWPVT-4 & ROWPVT-4 test kits. See Special Offers below.